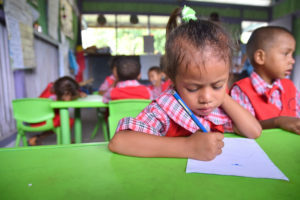 Some 20 years since the Sisters of St Joseph were invited to help the people of Timor-Leste in Tetun literacy, MMI’s dedicated local staff work at the grass- roots to empower whole communities by training teachers in the most remote and underserviced regions of the country. Through your support, 15% of teachers in Timor-Leste have been trained by MMI, providing the gift of life-long skills. Dedicated teachers like Graziela Fernandes, a recently trained year one teacher from the remote muncipality of Same, calmly explains to her students that it is time to prepare their bodies for reading. The children quiet down, cross their arms, and put their hands in their laps. Silence falls upon the room as Graziela begins to read, though the silence does not last for long! Before, during and after the story, Graziela continuously asks children questions about the story’s illustrations and narrative. She offers students the opportunity to share their personal opinions and whisks the book around the room so the students can have a closer look at the catchy illustrations. By establishing classroom routines through songs and games taught by MMI, Graziela has been able to engage her students in classroom activities in productive, child- friendly ways. She expresses that the training has also helped her to implement parts of the new curriculum, such as establishing a classroom literacy corner, in order to build a culture of loving literacy and reading in her students.